This is how I spent New Year's Day morning — at a huge birthday party. 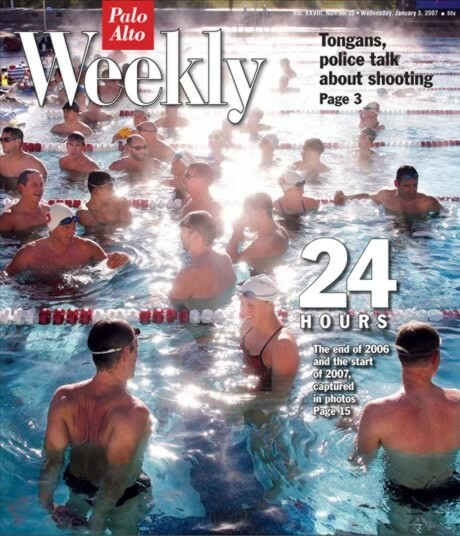 The Palo Alto Weekly sent a photographer (Norbert von den Groeben) out to chronicle various activities in and around Palo Alto during the final 12 hours of 2006 and the first 12 hours of 2007. One of his stops on New Year's day was a morning workout at Stanford to take some photos of the Stanford Masters Swimming team. This particular shot made the cover. I am in lane two (with the white cap with the red "S" on it). This was also a very large birthday party. There were 100 swimmers there and it was everyone's birthday. You see, for competition purposes all Masters swimmers "age up" on January 1st. Attendance is always high on this date. Our coach, Tim Edmunds, gave a us a tough workout and called it the "Resolutionizer" — about 4,500 meters with a lot of -5 and -10 second sendoffs. I've written earlier about Masters Swimming (FINA World Championships). It's an important community in my life. People are friendly and give each other good-natured razzing from time to time. Also, your identity is pretty much your personality in the water and how well you swim. Thus, you can swim with someone for six months and have no idea what that person does outside the pool. Then you start chatting, and that person says, "I teach physiology at Stanford Medical School," or "I'm head of strategy at Google," or "I manage a hedge fund for the Waltons." I swim with some interesting people. For example, in the photo I'm talking to IDEO designer Peter Macdonald. Right behind me is Fred Mitchell who was a long-time new venture VP for Adobe. Next to him is chemical engineer Ming Wong, and Marine Captain Sean Kelly. The bald man in the next lane over is Steve Fusillier, and he's a real "rocket scientist" at Lockheed. The woman in lane 1 is Jody Maggio Smith, former Stanford great backstroker and currently cover girl of Swim Magazine. We've also got three former Olympians — two of them gold medalists. Writing this post made me realize how many contacts I've made through the Masters swimming community over the past thirty years: my dentist, accountant, web designer, and physician are all current or former Masters swimmers. I guess that's the way communities work! You learn to trust people while you do something together that you enjoy. That's really cool, Roger! In fact, it illustrates the fun of blogging communities, too - you never know who you might get to meet one day. Very nice thought about community. I think we all have "things in common" and actually identifying these things is a real linker. It's funny how, from a reader's point of view, your post begins with a thought like "Nice picture... people swimming for a b-day party, cool idea". Link: birthday party. Then once you name them, say who they are and what they do... you actually see, designers, scientists, business men, sharing one common passion for swimming. This makes the link a lot stronger : passion. Robert and Luc: Thanks for your kind comments. Yes, one of the great benefits of living in northern California is being able to swim outdoors in January. Roger, we talked about swimming in the past, but this post just awakened my memories about competitions. 50 meters free-style: 25''20 is my best, but that was 5 years ago when I was 17. I switched from swimming to weight-lifting over those 5 years, so I am not sure what I would be able to swim today (stronger but heavier). Daniel: 0:25.20 is a very good time for 50 meters (long course I assume). If you could come anywhere near that time you could easily beat me. But I'm much more of a middle distance swimmer (200-400 meters), so perhaps it might be close in the longer distance. When I was your age though (almost 35 years ago), I could sprint: low 21 for 50 yards, high 23 for 50 meters short course, and mid 24 for 50 meters long course.